Today we went searching for our first yard sale of the season. My friend “S” told me about the ad for it and I admit, my heart went pitter-patter when I thought of visiting yard sales again. My husband, the two Scotties and I loaded into the car to follow my phone’s GPS. I made the mistake of not checking this address beforehand. In my neighboring town all addresses are “town” addresses even if they are miles out in the country. Well today, that address was way out in the country, dirt roads, one-lane bridges; you get the idea. We drove and drove and never did find the yard sale. Saw some bulls, some cows, some horses, lots of nice houses but no yard sale. Major disappointment. Happily, I have some items to share with you from a visit to my parents’ house last weekend. They are clearing things out bit by bit so it won’t be such a challenge when they decide to move. I remember from my childhood this little girl in her blue dress with white apron. She is made from a heavy metal. My mother has had her a long time. She was possibly made in a foundry near my grandmother’s home town. She’s been well loved and played with. 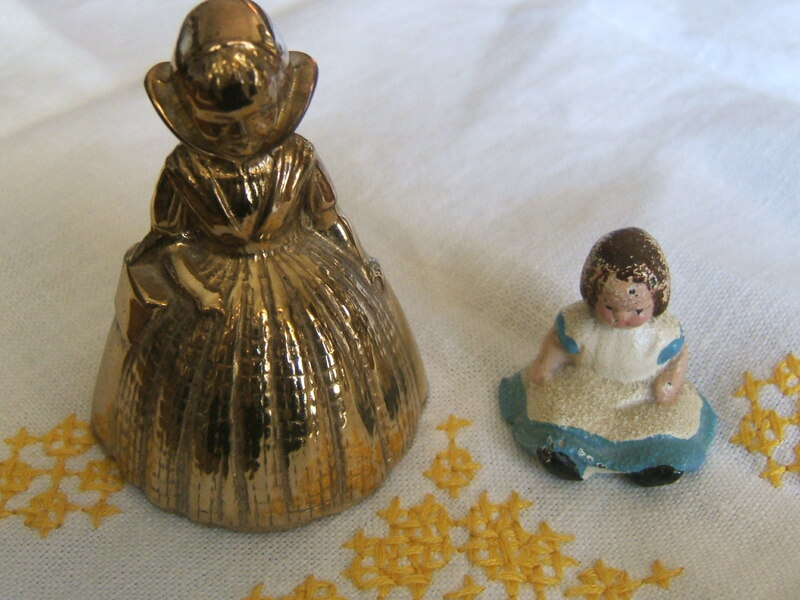 The maiden next to her is a brass bell that my daughter remembers playing with as a child. This bell makes such a lovely sound. 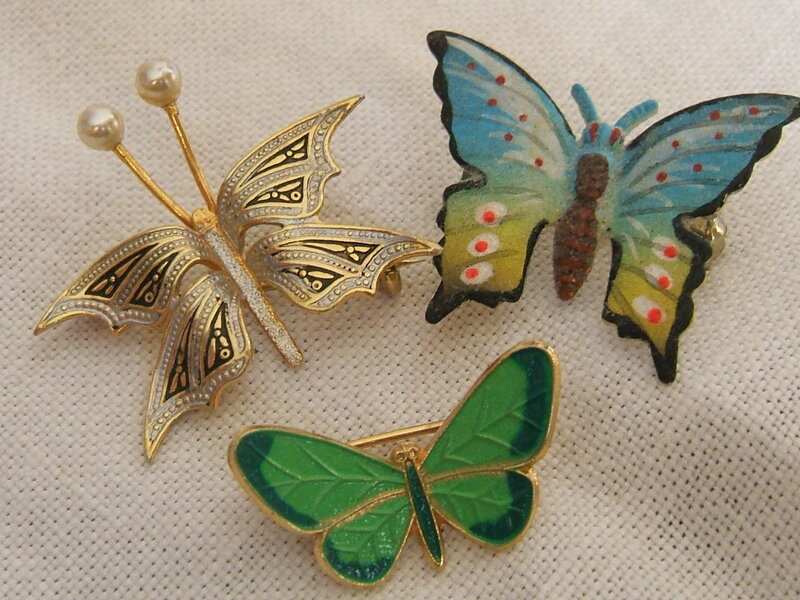 These three butterfly beauties were found in a small trinket box with some other jewelry treasures. 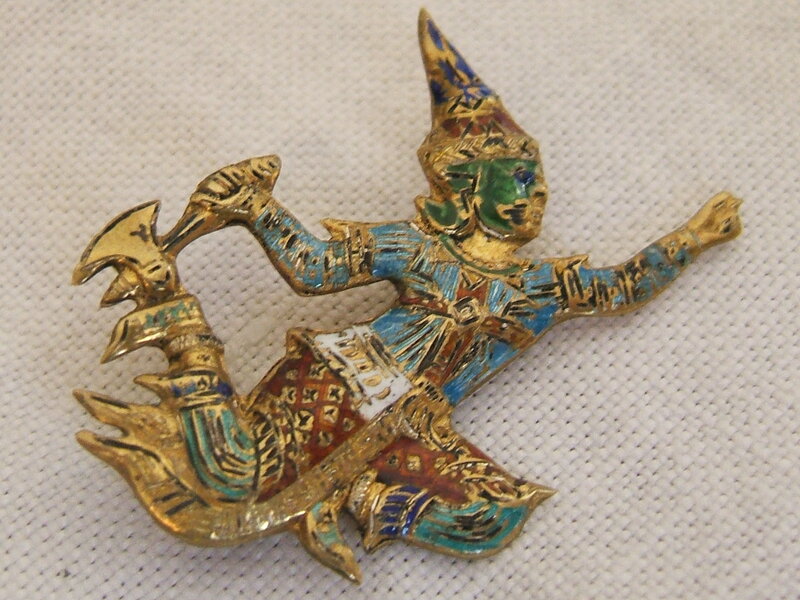 and this Thailand-made pin which my father brought back for my mother as a gift after a trip there. These are just a few of the treasures found in one of the little jewelry boxes my mother gave to me. I hope to share some of the other items with you in future posts. Often the best treasures are found at home; wouldn’t you agree? Some parties I like to visit are Flea Market Finds at Her Library Adventures, Apron Thrift Girl’s Thrift Share Monday, Knick of Time’s Knick of Time Tuesday, Nifty Thrifty Tuesdays at Coastal Charm, Thrifty Thursday at Tales from Bloggeritaville, Thrifty Things Friday at The Thrifty Groove, and The Penny Worthy Project at Hey, What’s for Dinner Mom? If you get a chance, stop by and visit them. 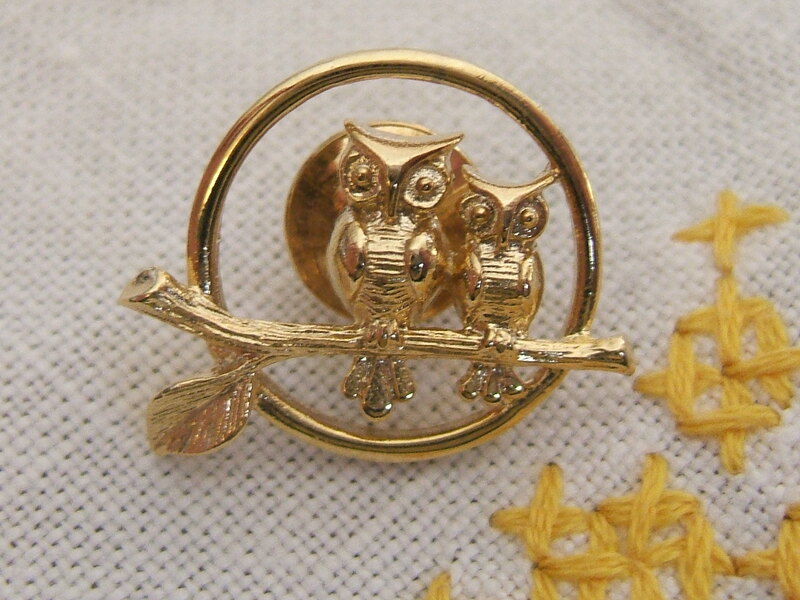 This entry was posted in Garage Sales, Owls, Scotties, Uncategorized, Vintage, Yard Sales and tagged bird pins. Bookmark the permalink. 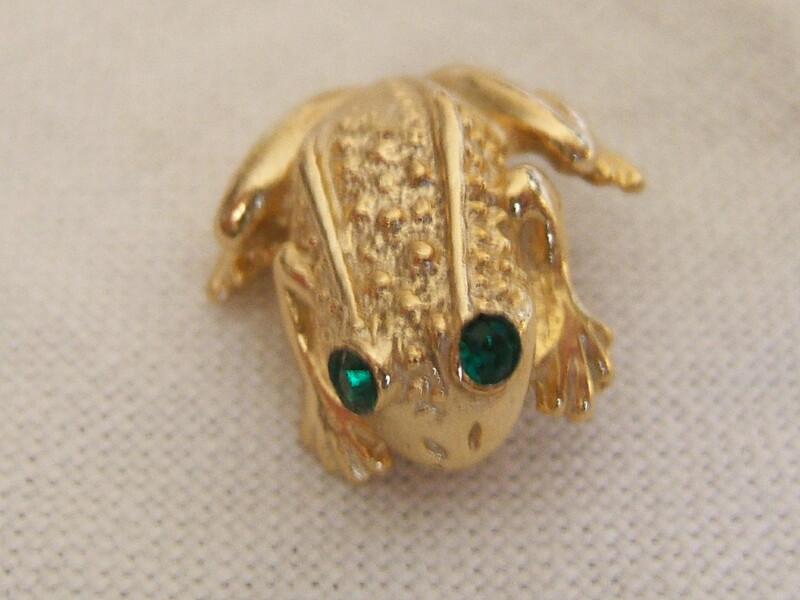 I love all your pins/brooches! My favorite is the hummingbird pin and the butterfly pins, my grandmother collected butterflies so I find myself buying vintage butterfly items as an homage to her memory. Wow — that little cast iron girl is amazing, and such a wonderful memory. 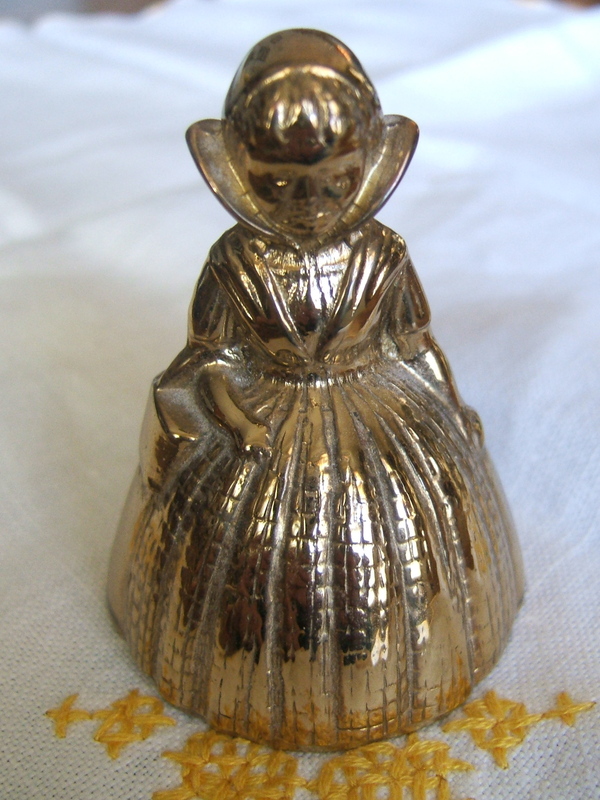 That bell is unusual and lovely, too! Ugh, don’t you hate when you put a lot of miles on your car and then can’t find the sale! Well, at least you got to do some sightseeing, even if it was only livestock! I sure do agree. My most cherished treasures are the things that have been passed down to me. Your mother’s jewelry is beautiful and your’re so lucky to have it. 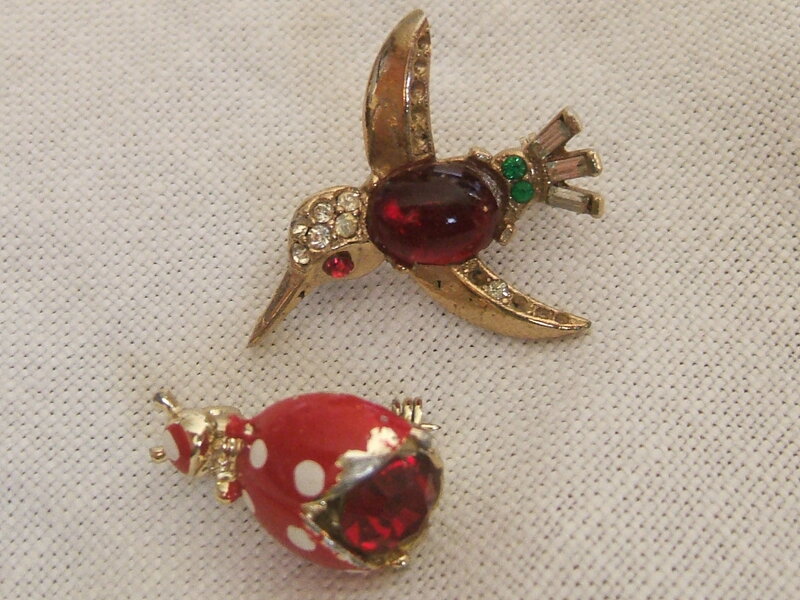 I love vintage jewelry and when they have a treasured memory attached, all the better! Great keepsakes to have from your mom. Thank you for sharing at TTF and have a wonderful week! Fabulous finds! 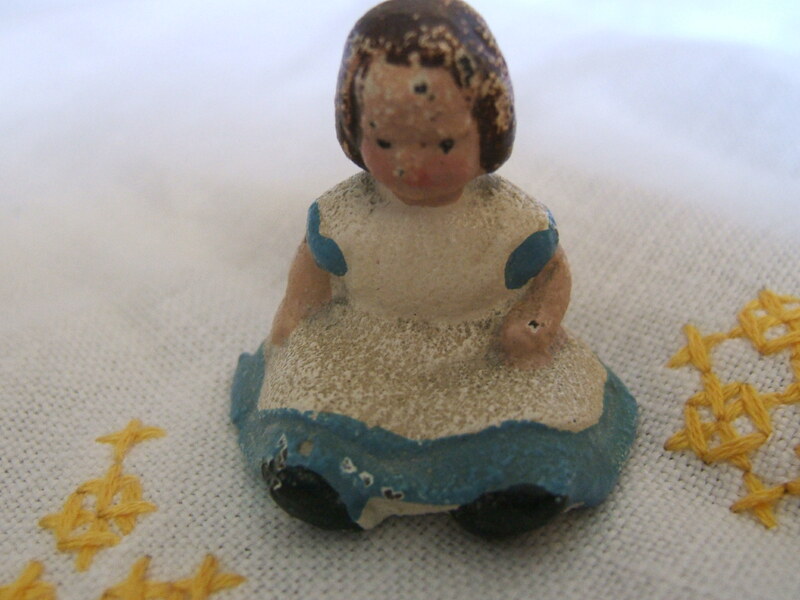 I like that little old doll, she’s so cute. Love the butterfly thought. Thank you for your lovely and kind visit. Wishing you a very HAPPY EASTER!